Phoebe Sinclair is the master of the 'sanger', the sad-banger. Hypnotic and addictive; her songwriting is deceivingly good, filled with soaring highs and crashing lows. Her live performances transcend listeners, leaving hearts in throats and melodies in minds. Originally hailing from the shores of northern England, the now Brisbane based singer is making an impact with her unique combination of soulful vocals, evocative lyrics, and intoxicating beats. Her signature style is reminiscent of artists such as Sigrid, Wafia and Ellie Goulding, but with that little twist - standing Sinclair out from the crowd. Having received national community radio play and critical acclaim from tastemakers Music Is My Muse, Scenester and AAA Backstage, the emotional wreck turned songstress has collaborated across the globe. Since her 2016 debut she has co-written and featured on tracks in the UK, USA, Canada, France, Sweden and NZ. 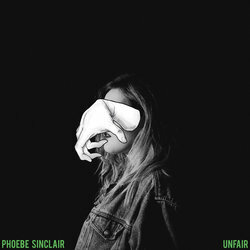 Channeling powerful vocals, with strong lyrical conviction to match, Phoebe Sinclair’s first new single is a soul-tingling ode to how Unfair the experience of love can be. Speaking straight to the heart of anyone who’s felt the pang of heartbreak, Unfair is an electronic-pop smash that beautifully rages against such despair whilst also hoping to be spared.